Italian painter and woodcutter, a pioneer of the chiaroscuro woodcut. In 1516 he requested from the Venetian senate a patent for his method of making from woodcuts prints that seem as though painted , and although there are German examples earlier than any known by Ugo, he may have discovered the technique independently. Certainly his prints achieve their pictorial effect better than those of the Germans. They are often based on designs by Raphael and Parmigianino. 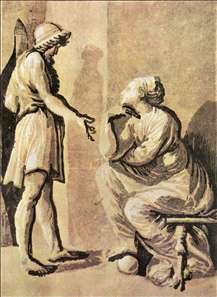 See more details about "Hero and Sibyl"